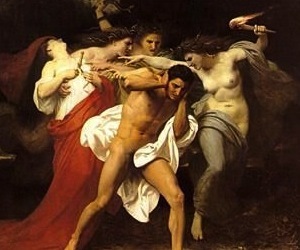 The Eumenides Allekto, Tisiphone, and Megaira, also known as the Erinyes, preside over crimes against the natural order – especially familial violence, oath-breaking, and hubris. They were born when the blood of Ouranos fell on Gaia, but may also be daughters of Nyx. In Orphic theogony, their mother is Euonyme, but they can also be the daughters of Hades and Persephone. Kerenyi states that “in the neighborhood of Megalopolis in Arcadia, sacrifices were made to the Eumenides and the Charites simultaneously” (Gods of the Greeks, 47). There is a strong connection between the Eumenides and Charites in Arcadia because both receive similar sacrifices. As Eumenides translates to “the Benevolent,” the function of this aspect of the two triads of goddesses may have been similar in Ancient Greece. 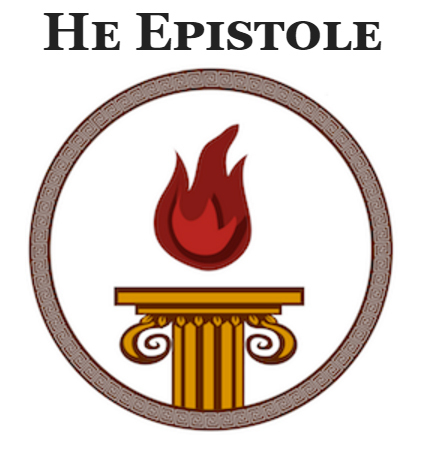 The Derveni commentator, who is pre-Platonic in philosophical outlook if not date, is aware of a preliminary sacrifice that the initiates (mystai) offer to the Eumenides “in the same way as the magoi.” The magoi offered cakes and libations of water and milk as part of a sacrifice that they perform “as if they were paying a penalty;” the aim of their rite was to placate dead souls that might otherwise “be in the way.” (Ritual Texts for the Afterlife, 149). According to sacred iconography, the Erinyes are depicted with snakes in their hair and black skin. They frequently have wings. Once placated, the Erinyes transform into the Eumenides, and their skin sometimes becomes white. It is customary to address the Eumenides by a positive name, much in the same way that it is customary to call Hades “Plouton.” The Eumenides are associated with the sacred priestesshood of the Hesykhides, or descendants of Hesykhos, in Attica. The Eumenides are the protectors of natural law. Eumenideia (near Diasia, most likely in Anthesterion) . Make amends with close family members. Make and keep oaths to the Gods. Follow a comprehensive ethical system such as the Delphic Maxims, Commandments of Solon, Aristotle’s Ethics, or Golden Verses of Pythagoras. Hold yourself (and others) accountable for their actions. Learn how to do ritual purification and offer your services to the community.